The Bureau of Transportation Statistics (BTS), as part of the United States Department of Transportation, compiles, analyzes, and makes accessible information on the nation's transportation systems; collects information on intermodal transportation and other areas as needed; and improves the quality and effectiveness of DOT's statistical programs through research, development of guidelines, and promotion of improvements in data acquisition and use. BTS is a principal agency of the U.S. Federal Statistical System. BTS was created in 1992 under the Intermodal Surface Transportation Efficiency Act. Since 1998 when the Transportation Efficiency Act for the 21st Century was enacted in 1998, an external advisory council, the Advisory Council for Transportation Statistics (ACTS), has advised the BTS director on the quality and objectivity relating to BTS data and analysis. ACTS meetings are open to the public and held 2-3 times per year. 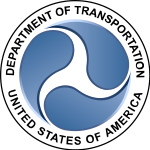 The Deputy Secretary of Transportation established the Committee on Transportation Statistics (CTSTAT) in January 2000 to assist in bringing together data and statistical expertise. BTS chairs the committee, but all operating administrations take part, as well as the DOT Inspector General, DOT Chief Information Officer, and the DOT Assistant Secretaries for Policy and Budget Programs. Since 2009, BTS has also maintained a Twitter feed, with regular tweets related to the release of BTS data products and news bulletins concerning transportation trends in the United States. BTS' Office of Airline Information is responsible for publishing regular reports–often monthly or quarterly–on airline performance in the United States. Topics include airline financials, origins and destinations, passenger traffic, on-time performance, and mishandled baggage. BTS maintains the National Transportation Atlas Database (NTAD), an online repository of national-level geographic information systems data and applications related to transportation in the United States. Another BTS product is the National Transportation Library (NTL), an online repository of transportation-centric research, reports, and datasets. Documents, which include products internal and external to the US Department of Transportation, can be accessed through a platform called RosaP. TranStats is BTS's "Intermodal Transportation Database" that includes databases and statistics for aviation, highway, maritime, rail, pipeline, pedestrians, and more. Data include financial, safety, usage, and environmental information. The BTS maintains its own list of codes, so-called World Area Codes (WAC), for state and country codes. ^ a b "About BTS". Bureau of Transportation Statistics. Department of Transportation. Retrieved January 10, 2019. ^ "History of BTS". Bureau of Transportation Statistics. Retrieved January 10, 2019. ^ "Airline Information for Download". Bureau of Transportation Statistics. Retrieved 14 March 2019. ^ "NTAD". Bureau of Transportation Statistics. Retrieved 14 March 2019. ^ "NTL". National Transportation Library. Retrieved 14 March 2019. This page was last edited on 15 March 2019, at 01:23 (UTC).